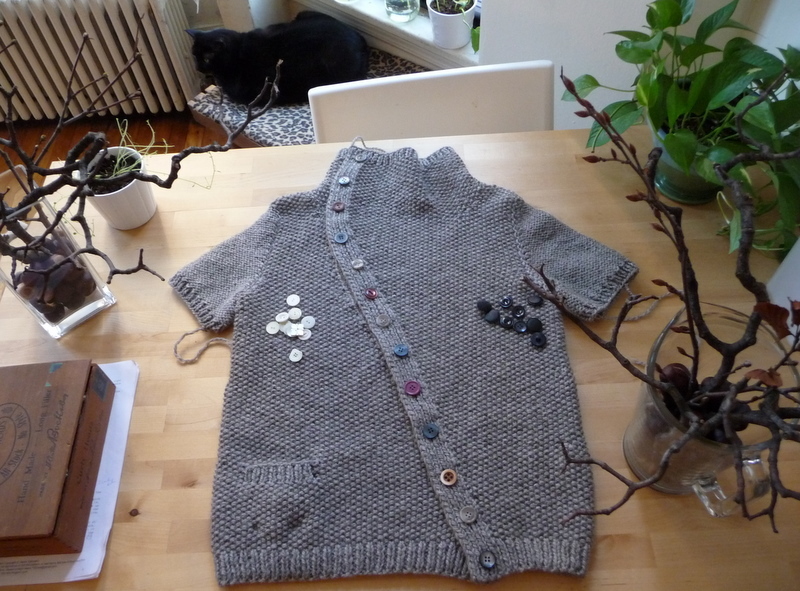 I cast on for a new sweater last week, using this batch of handspun wool/silk tweed. I had swatched for a couple of things, but nothing was quite right. I plied it fairly tightly, so it’s a little stringy and didn’t look great in stockinette. 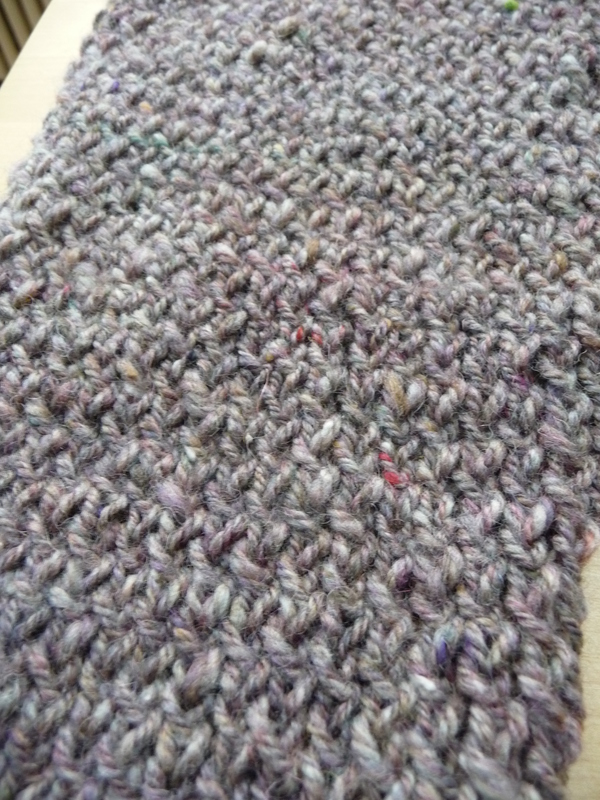 I did, however, like the way it looked in a twisted stockinette. 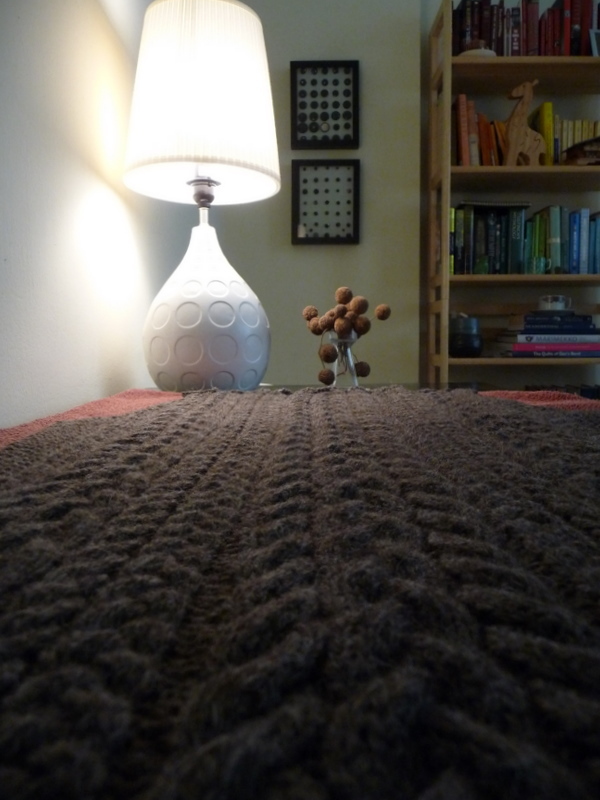 Knitting every other row through the back loops changes it up just enough to be a little interesting, while still allowing the yarn to shine. 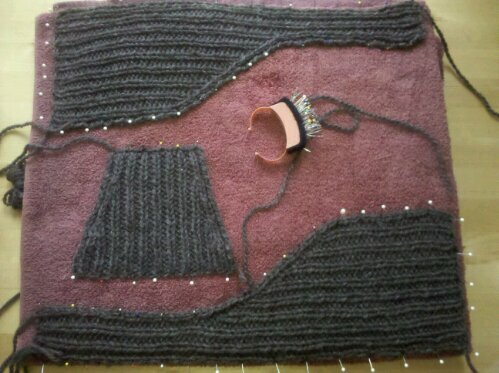 I’m making a very simple pullover, possibly with a big turtleneck if I have enough yarn. I don’t love working with yarn this chunky — I’m knitting it on US11s — but I can’t deny that it goes quickly and the results are pretty dramatic. 1. I finished this sweater over the weekend. 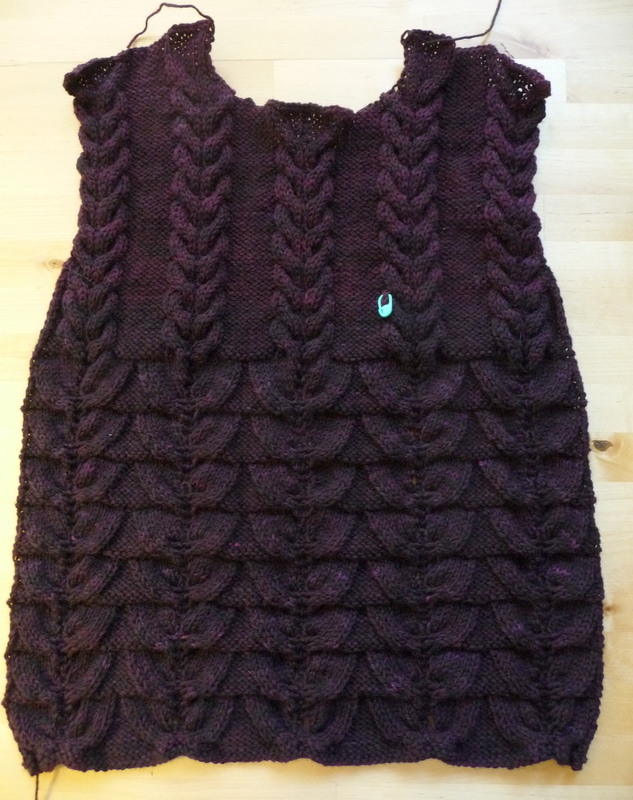 Still need to give it a final blocking and get a photo of it on me though. 2. I started writing a column for Serious Eats NY. Each week, I’ll be profiling a local food artisan and reviewing one or more of their products. I’m really excited about the gig; it should be a lot of fun. 4. I finally got around to watching all of Party Down over the holidays. Holy cats, that was an awesome show! Too bad it was canceled before I even knew it existed. 5. 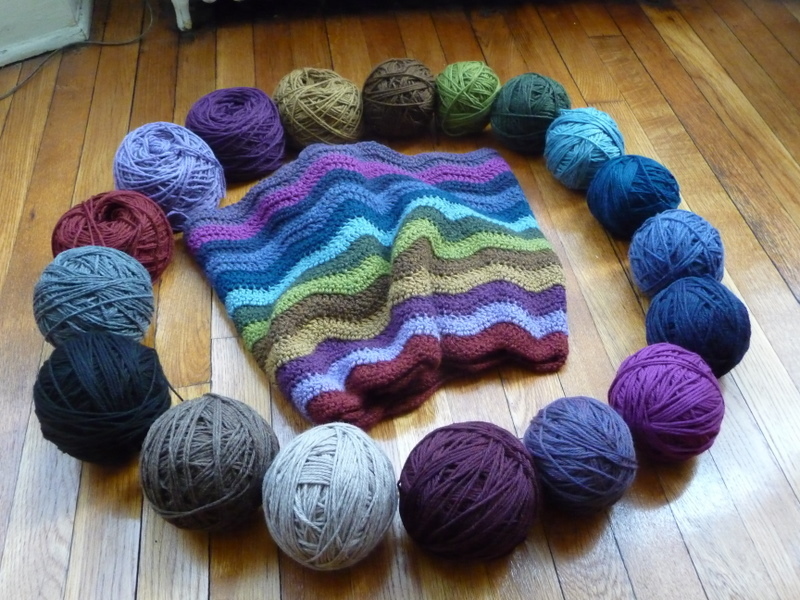 And I did a fair bit of work on my ripple blanket over the holidays. I had to add a few colors, since I’m not going to get as many stripes out of each skein as I expected, but I think it’s working out fine. This is for an experiment I’m not quite sure about yet. It’s going to be either fantastic or hilariously awful, no possible middle ground. Will report back later this week. edited to add: It’s not an undergarment. Geez. This morning, I was working on the buttonbands for my next design and lining up a photographer to shoot it this weekend (since Carolyn has the nerve to live somewhere I don’t) and thinking about locations and how I want to style it and talking to my tech editor about when I’ll have the pattern for her to look at and emailing my graphic designer to give her a heads up about the schedule and checking Ravelry to see if the name I’m considering has been used much and tending to all of the other little things that go into releasing a sweater pattern into the wild and it occurred to me that people might want to get a glimpse of what’s coming. It’s not a particularly illustrative glimpse, to be sure, but what fun would that be? 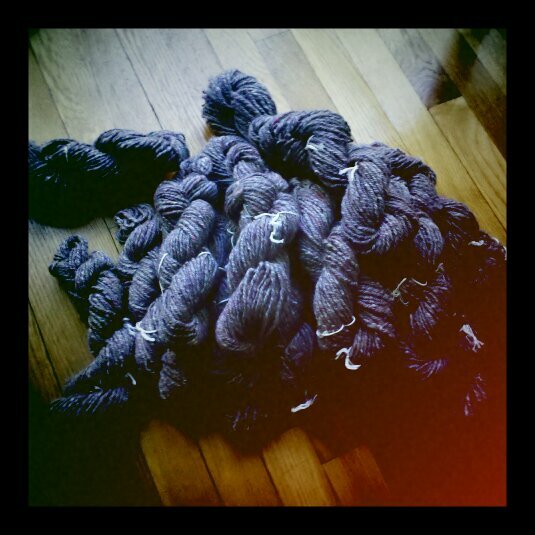 I finished plying all of the wool/silk tweed over the weekend and skeined and washed it. I was a little surprised to have ended up with only 1057 yards. Somehow, it hadn’t occurred to me that a three-ply yarn would yield fewer yards than a two-ply. It’s still enough for a sweater for me though, which is all I care about. I haven’t swatched it, so don’t have a for-sure gauge yet, but I’m thinking Aidez might be a good fit. It feels good to have this one almost done. 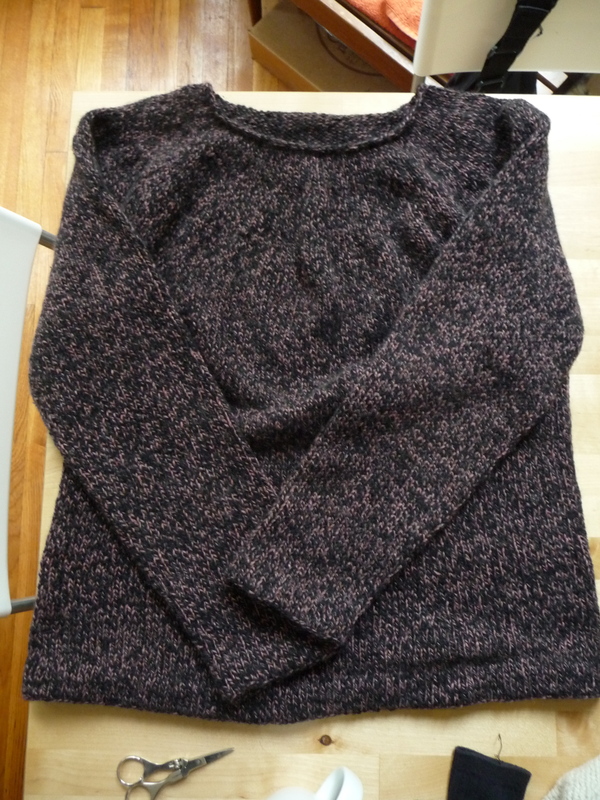 It took a weirdly long time to knit, considering that it’s chunky yarn and has short sleeves, and I’ll be very happy to move it from the project basket to a dresser drawer. It would be nice to end 2010 with no long-standing projects still in the works, especially since I have several ideas for new designs I’d love to focus on next year. I should sort through the bins and bags this week and see what I unearth. 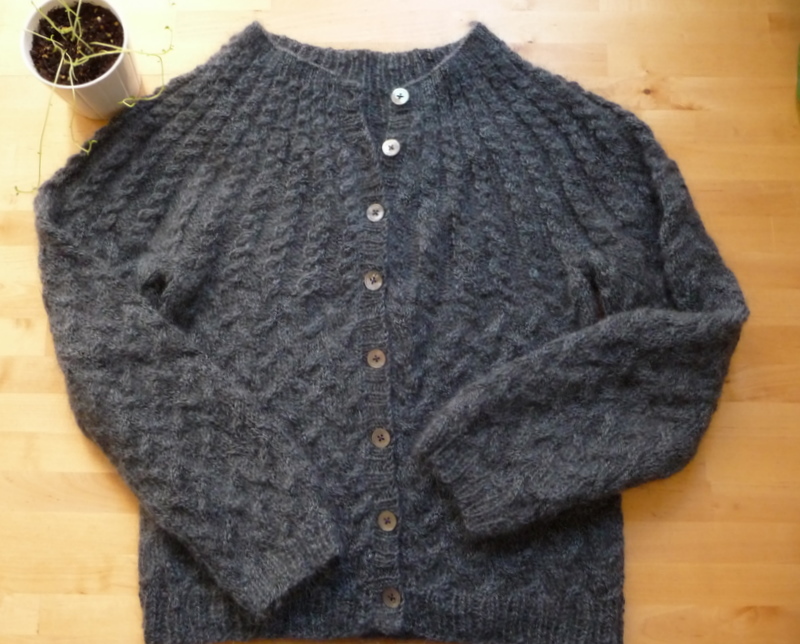 This is the sweater that I reknit when I made Herkimer. I made it out of some wool/mohair handspun last spring and was really happy with how it turned out, but when I polled some knitting friends about how people would react to a pattern made in handspun, even with a standard gauge, they all said no. In the end, I’m really, really happy that I redid it. The Ultra Alpaca has much better stitch definition and the lighter color shows off the details much better than this navy blue. Plus, reworking the sweater allowed me to refine the pattern and tweak some fit issues (in the unlikely event that I develop serious biceps, this cardigan will still clothe them comfortably). I’m still awfully fond of the original version though. This was a bit of a risky endeavor, as these things go. I knew that I’d like this sweater more if it were solid black instead of the less-appealing-to-me black and pink tweed. But dyeing whole garments is trickier than dyeing yarn or fabric, since it’s a lot harder to dye big pieces evenly. I wasn’t really worried though, since most of the sweater was already the color I was aiming for and if the pink parts took the dye unevenly it would still be more interesting than it was. I used Jacquard acid dye in black and my enormous stainless steel dyepot and was happily surprised by how evenly the dye took and how very, very black it is. I’m pretty happy with how the sweater turned out overall. The neck is higher than I’d normally choose, but I like the sleek, fitted effect. 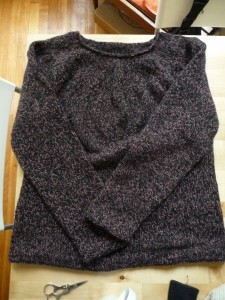 Just in time for the first of the real fall weather, I finished this cashmere/silk pullover last night. It still needs to be washed and blocked before I do a modeled shot, but all of the ends are woven in and I’m calling it done for now. It’s a very plain stockinette sweater with hems at the sleeves and lower edge, princess-seamed waist shaping, round yoke and bound-off neck. 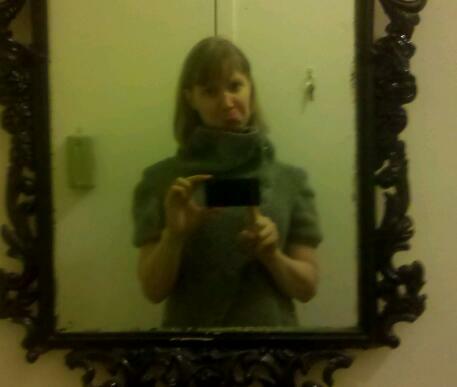 I tried hemming the neck, but it was too bulky and didn’t really need it anyway. 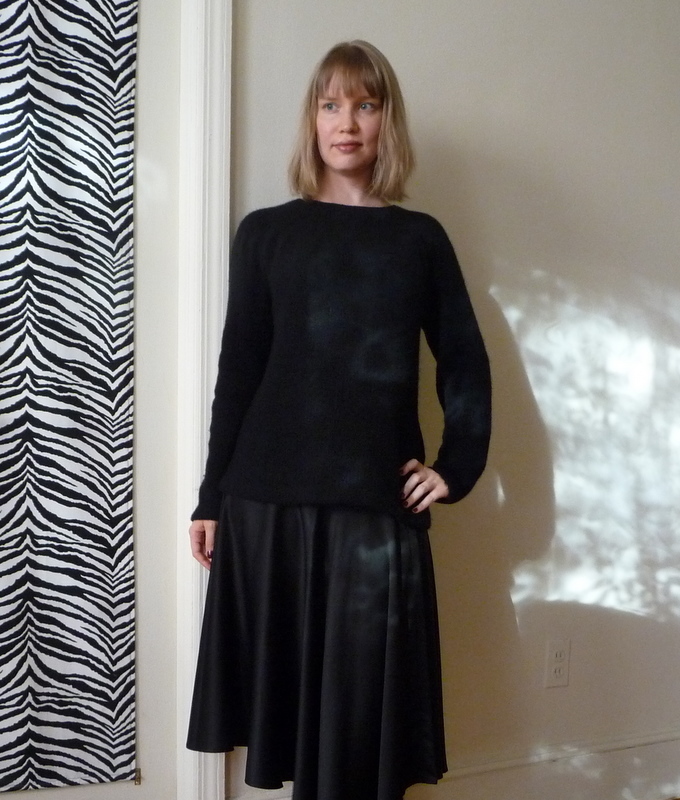 This is also one of the more quickly knit sweaters I’ve made in a while: cast on Sept. 3, bound off Oct. 4.